Another late night, and another singer-songwriter! And lest you think my musical tastes run one genre wide, take a listen. Gueldy René is different. In his own words, "My guitar is my weapon, and peace is my goal." He's fighting prejudice, injustice, corruption, and poverty with his music. Whew -- makes me feel lazy in comparison! 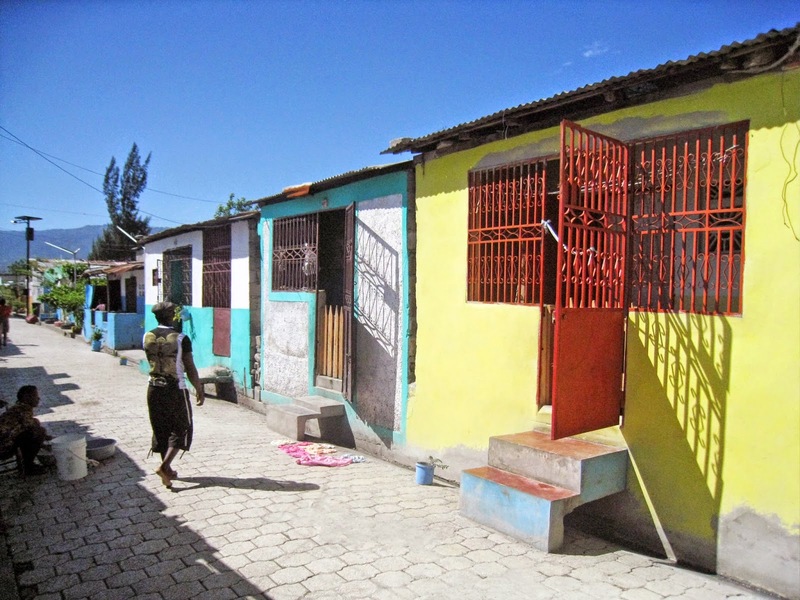 Gueldy is from Bois Neuf on the outskirts of Cite Soleil, Haiti's largest slum. The place has a violent reputation, but he and others are trying to change that. I first heard about Gueldy from friends and acquaintances working in Port-au-Prince. They launched an Indiegogo campaign to help record his first album, and with the help of many backers he's on his way to the studio! While I've never met Gueldy in person, his charisma in the video above -- a song written in the wake of the 2010 earthquake (with a great little back up singer) -- and in others makes me like him a lot. But it's his lyrics and the meaning behind his songs that really launch him beyond just "nice" music. "The winds of change are coming. Konbit, konbit to save our youth." The song calls for education, for governmental accountability, for mutual respect, for "democracy free of demagoguery." Even for clean canals and planted trees. It seems like a laundry list of impossibilities, but there's progress being made through various communal efforts (like Konbit Soley Leve) and the help of outside organizations to get things rolling. Back in 2011, I visited Haiti for a research fact-finding trip (or, a "I don't know what I'm getting myself into but here goes!" kind of trip). The Tall Man (at the time my Tall Boyfriend) and I were too chicken to visit Cite Soleil during most of the week, but we finally threw reservations to the wind when we were given the opportunity to tag along with friends from Haiti Communitere, the NGO we were staying with. What had I expected? Maybe something scary? I had been to various parts of other development countries before, but never in a post-disaster situation and never feeling so out of my element and exposed. I have written a bit about this before but will write again that what I found was stunning. Clean, paved roads. Planters with trees and saplings along the drainage trenches. A nascent recycling operation to encourage people to clean out the clogged canals and earn some income. This was accomplished with the initiative of a then-13 year old who was tired of having his shoes reeking with the stench of sewage and wanted things to be different. Change (chanjman in Creole) comes with a soundtrack, and one of those voices is Gueldy's.